support than when Hughes Hall opened in 1964. An overhead view of Hughes Hall, the southern side of which hugs the contours of Cascadilla Gorge. Designed as a residence center, Hughes Hall was given by Myron C. Taylor, who named it in honor of his teacher at Cornell Law School, Charles Evans Hughes. 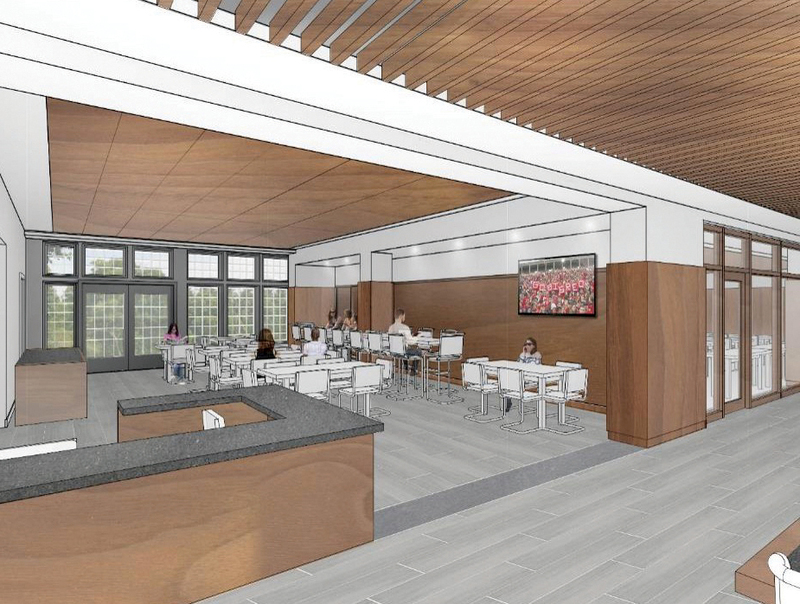 Myron Taylor’s $1,000,000 gift underwrote the construction costs and the facility housed Cornell Law students for several decades, as well as Law alumni returning for Reunion each June. The Law School’s 2013-2014 construction project, which created a beautiful, state-of-the-art Wing for Academic Instruction and Main Entrance, argued for a re-envisioning of Hughes Hall inside and out. With a total student population of almost 700; a full-time faculty of 57 and 51 part-time instructors and adjunct professors; and support staff in Communications, Career Services, Alumni Affairs & Development, and Administration & Finance, Cornell Law School must optimize its available space. The 2016-2017 Hughes Hall project does exactly that. The project will convert the building’s lower levels into modern spaces essential to the fulfillment of the Law School’s educational mission. directly to the Berger Atrium; an enclosed, exterior staircase on the building’s west face. The Loggia will feature an exterior wall of full-height windows, overhead ambient lighting, and an adjoining vestibule. It is an enclosed space that connects Hughes Hall to Myron Taylor Hall and the Berger Atrium. The Front Entry Plaza is located outside the Loggia and leads to the new ground-level entrance at the front of Hughes Hall. It will offer a level expanse created with granite pavers. The new West Stairway will be constructed on the west face of Hughes Hall. Its five flights will be enclosed in glass and afford views of West Campus, Cayuga Lake, and West Hill, as well as downtown Ithaca. The Dining room will feature open seating, granite countertops, red oak paneling on walls and ceiling, and a granite floor. The Event Room will be the foremost public space in the reconstructed Hughes Hall and will host activities and events sponsored by the Dean’s Office; the Law School’s student journals; the Career Services and Public Service Offices; the Dean of Students; International and Graduate Education offices; and Law Alumni Affairs & Development. High-quality hardwood will finish the ceiling and panel the front wall, as well as support columns. Fixed table-desks also will be made of high-quality hardwood. Work has begun and the project is due for completion by January 2018. Naming opportunities are available at many levels for a variety of prominent spaces. 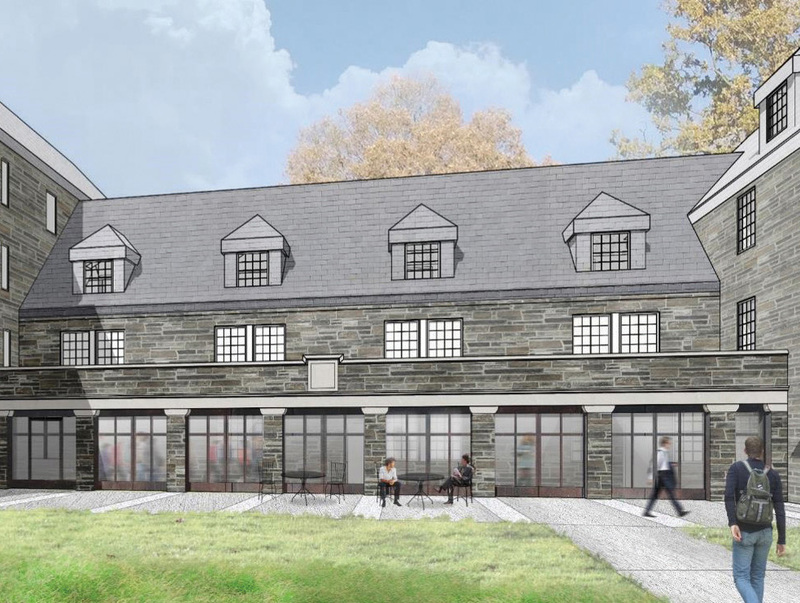 We invite Cornell Law alumni and friends to participate in making Hughes Hall new again through a gift that will help us translate vision into reality. Development Office at (607) 255-3373.